I cover a range of areas within West Yorkshire, my main focus is within the circle shown on this map. 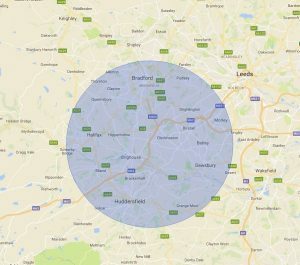 If you are not located in this area don’t worry, please just contact me and we can discuss your requirements. I am willing to travel further but there may be an additional charge made to cover travel expenses. Please click on the image to view it in more detail. View the treatments available from Pure Opulence Beauty or call me on 07932 888177 to make an appointment.